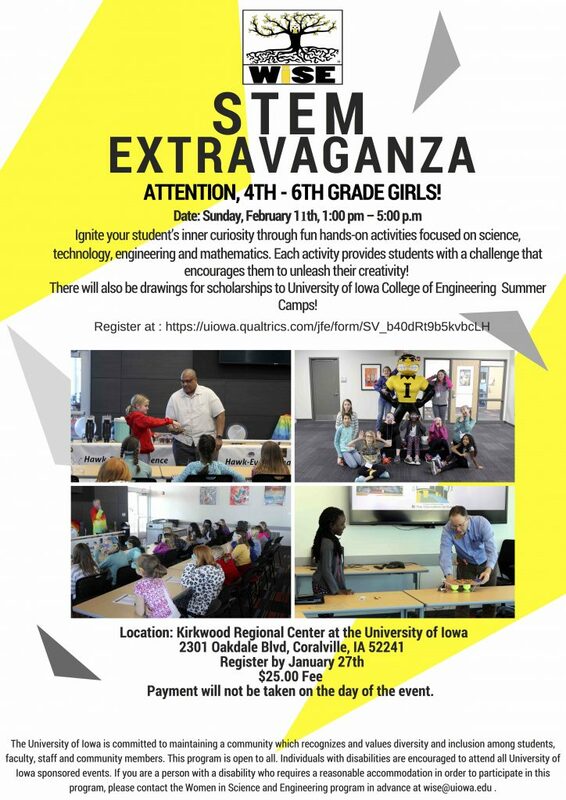 The WiSE STEM Extravaganza for 4th-6th grade girls will take place on Sunday afternoon, February 11th, 1:00 – 5:00, at the Kirkwood Regional Center at the University of Iowa. Students will participate in 2 large-group activities and 4 smaller breakout sessions that focus on Science, Technology, Engineering, and Math (STEM). UIowa Faculty/staff, community professionals, and/or university student organizations will be facilitating the sessions. Enjoy a fun afternoon with the Women in Science and Engineering!